If you’re hosting WordPress on your own server, it does not need FTP credentials. This page is a symptom of a permissions issue with the underlying server. 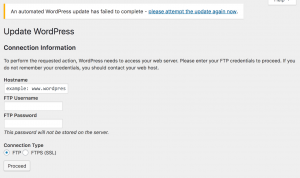 The web server (typically Apache) is unable to write the updated files to the WordPress directory. From a security standpoint, this is actually a good thing. You generally don’t want to allow a public-facing service to make changes on your server. This problem occurs in other situations, such as configuring the WordFence plugin, so I’ve written a page devoted to troubleshooting WordPress permissions on Linux hosts. That page describes how to fix the permissions issue without compromising the general security of your WordPress host.